When we featured Spoonflower, the company who makes it possible for anyone to be a fabric designer with their custom fabric printing service, we decided it would be fun for our community to see some of the fabric designed by their community. Spoonflower hosts a weekly design contest and so we asked to pull the winners of the past six contests and host a contest at Daily Grommet. Although all of the designs were amazing, the winner of our contest was Andrea Roman's "Finding Love." I had a chance to ask Andrea a few questions. I am a mother to an active and spirited little boy who will be two next month and a wife to an amazing husband who is my creative sounding board, comic relief and rock. I am more than blessed to have wonderful family and friends who inspire, support and believe in me -- I just don't know where I'd be without them! An Architectural Drafter by trade, we got hit hard due to the economy, so I am currently on the job search and truly enjoying my 'adventures' at home with my son in the mean time. 2. Did you always want to design fabric or is it something that you were inspired to do upon discovering Spoonflower? Definitely inspired! I've always had the creative bug--an artist in my own right, I dabbled in all kinds of artistic genres, but it really didn't come full swing until I got into scrapbooking. The peace I find through creating and my love for the amazing designs on paper turned to fabric, as I found that fabric designs have come a long way! Taking what I learned from my mom who made a lot of our outfits when we were young and my grandma who is an amazing seamstress and quilter, I dusted off the sewing machine and started making things for my son, nephew and nieces (actually, the first thing I made was a curtain for my new sewing room!). To support what was becoming a fabric addiction:), I started a little Etsy shop and that is where I discovered some amazingly talented artists who used Spoonflower. Spoonflower gives me the opportunity to design the fabric I could never find in a fabric store and in turn, be able to make things in my shop even more unique! Now I'm hooked and love the challenge of turning a 'picture' into a repeating pattern for fabric. 3. What inspired "Finding Love"
"Finding Love" was actually my first try at fabric design. I love the outdoors and amidst another long Minnesota winter, I longed for spring to come and the birds to return and the trees to start budding so I found myself sketching out a little nature scene that I hope to find in my back yard soon! 4. When you were designing "Finding Love" did you envision it for any particular use? This pattern actually started in full bright colors, but I ended up with the final design of black and white with a splash of the red to really make the hearts pop for the Spoonflower love contest. I was envisioning a little apron or pillow of this print with red trim; a quilt with black, white, and splashes of red blocks; a little black purse with this fabric on the inside for a surprise pop when you open it -- I really tried to make this design as versatile as I could. Since Spoonflower offers many different kinds of fabric to print on, I could also go with their Organic Cotton Knit for an earth conscious little baby hat and matching blanket for a great shower gift! Now, if I could just find the time...! 5. For winning the Spoonflower contest, you were awarded five yards of fabric with your design. How do you plan to use this? I think I just used up those five yards in the above question! :) Actually, along with turning my own fabric into some fun and useful items, I also look at it as a great opportunity to grab a sample of some pieces from the other talented designers of Spoonflower! They leave me amazed and regularly thinking, "why didn't I think of that?!" Hopefully some of those will lead to great unique items for my shop! 6. You have an Etsy shop (Click here to go to Andrea's Etsy Shop). Tell us about some of the items you have there right now. T♥toz is actually inspired by my dad, Tito Zarate (hence my shop name), who was a hard working, very creative and gifted man. He passed away from cancer four years ago so to keep his fight alive and give what I do even more heart and meaning, 10% of everything sold goes to The American Cancer Society. I think it is so important to give back through the gifts you've been given--one person/one gesture does make a difference. Since I tend to find inspiration everywhere, my shop has a mix of items, but my main focus has been on baby to toddler clothing and accessories. They are just so much fun to create and I have some wonderful models that work for hugs and animal crackers:). 7. What are you working on for your Etsy shop that we can look forward to in the future? I hope to turn my focus back to making more designs for the little boys in our lives! Girls fabric and clothing are SO cute and yet the things we find for boys just seems to fall flat. I also have a few prototypes of more versatile children's clothing just waiting for the right fabric to debut -- enter Spoonflower! My real passion is doing custom orders! With a little guidance of what someone is looking for, colors, etc, I just love the creative leeway people give me to design something great just for them! 8. Will you be entering more fabric design contests? Most definitely! I really like Spoonflower's fabric-of-the-week contests as they push me to try design themes I wouldn't usually do on my own. For example, the up coming contests are 'Tattoos' and 'Art Nouveau' and though I may not enter these particular contests, it gets me thinking of adding that kind of flair to some of my future designs--and I will certainly be inspired by all the entrants that do tackle these themes! Thanks Andrea, it was great getting to know you better! Click here to see all of the winning fabric entries and to learn how you can design your own fabrics! I saw Spoonflower and didn't really "get it." Thanks for posting this interview. 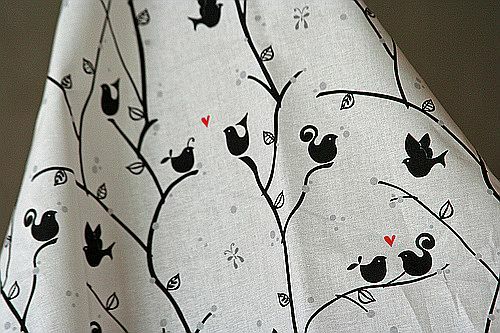 It gives me the ability to conceptualize how one would use Spoonflower... And I love Andrea's elegant creation!